The choice of the right sisal cloth lapper for polishing with the most suitable facing and the corresponding degree of hardness must be determined customer-specifically according to the respective application. With our many years of experience, we will be happy to advise you by telephone or on site regarding a high-quality and cost-effective design of sisal cloth lappers for your process. Sisal cloth lappers are made of slats placed on edge, which consist of sisal and cotton fabric sewn together. 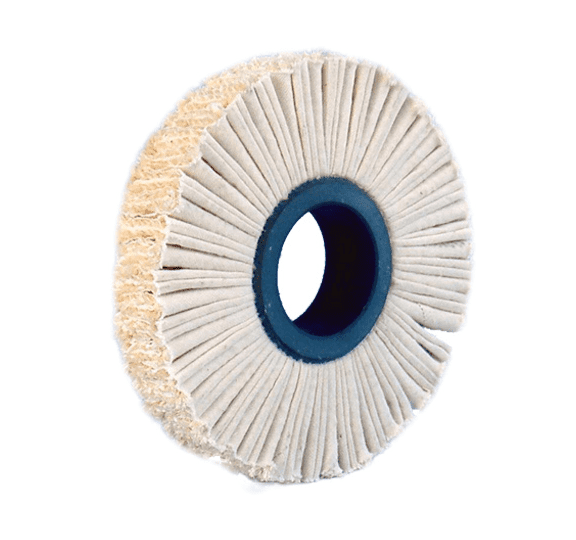 The sisal cloth lappers can also be equipped with abrasive cloth flaps in various grit sizes. This type is used, for example, for edge grinding on veneer panels. Instead of polishing rings, sisal cloth lappers are used to remove particularly strong hot-melt adhesive residues. They are also used for polishing edges of thick-walled plastic coatings. For sisal cloth lappers with a diameter of 160 mm, the maximum speed is 3,580 rpm. For sisal cloth lappers with a diameter of 200 mm, the maximum speed is 2,865 rpm. All sisal cloth lappers may be used up to a maximum cutting speed of 30 m/s. The maximum cutting speed for sisal cloth lappers is 30 m/s.